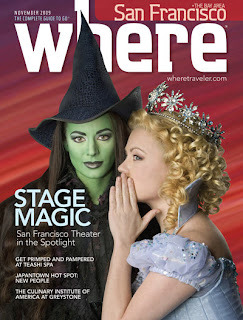 This month, “Wicked” is featured on the front cover of San Francisco’s “WHERE” Magazine, with Teal Wicks (Elphaba) and Kendra Kassebaum (Glinda) doing the standard “Wicked” logo pose. Take a look! This entry was posted in Uncategorized and tagged Kendra Kassebaum, San Francisco Production, Teal Wicks. Bookmark the permalink.